On Tuesday, Jared, his staff, friends, and family, finally saw the ultimate result of their hard work and sacrifices for the past year and a half as he was elected to serve in the United States House of Representatives next year. Jared won by a convincing margin, 60% to 36%, over his primary opponent, Scott Starin. Before heading to downtown Denver for the Democratic Election Party at the Sheraton Hotel, we stopped by a couple of election watch parties in and around Boulder County. Everyone was fired up as the early results displayed on the TV showed a decisive blue shift in Colorado and national politics. I can only imagine the somber and sad scene at some of the Republican watch parties; in most races, they really got pounded. As Jared was introduced, I saw a different Jared than I have seen over the past week. Instead of calm, cerberal Jared, he transformed into a motivational leader, rousing the group assembled at Woodies restaurant with an exciting speech of hope and change. That was a small hint of what was to come when he was introduced as the new Congressman-elect of Colorado’s District 2 at the Sheraton Hotel. Jared’s staff and family were hanging out in the restaurant and a suite in the Crowne Plaza. Jared stopped by the suite and popped the cork off a new bottle of vintage Jared Polis 2008. I met Jared’s brother, Jorian, after what must have been 15 years; he had grown so tall in the intervening years while I have stayed the same height! I was looking through my senior yearbook the other day, and I noticed that those who were pre-schoolers when I was a senior would have graduated from college this past year! After spending some time in Jared’s suite, we headed a few blocks over to the Sheraton. Our entourage made its way backstage, stopping several times as people came up to Jared to congratulate him. This would be a common occurrence throughout the evening! It was a madhouse at the Sheraton. All of the major TV networks had set up their crews in the backstage of the grand ballroom. The press photographers were milling around, with many of them situated in the front to catch the action at the podium. I didn’t get my media pass because I was following Jared the entire time, but it didn’t matter as long as I hovered around him (I also had an All Access Staff Pass, but I rarely used it). It would have been cool to have gone to the media center to see everyone sorting through the posting their photos to their editors. Later in the evening, we went back to the Crowne Plaza’s restaurant, where we had a private party for Jared. I finally met up with Rae, who had driven into Denver from Aurora. We watched as McCain gave his gracious concession speech and listened quietly to Obama’s powerful acceptance speech. With people like Jared and Obama in office, I’m hopeful that the next four years will be better than the past several years. Check a sample of the photos from Tuesday night’s events or check out the complete gallery here! 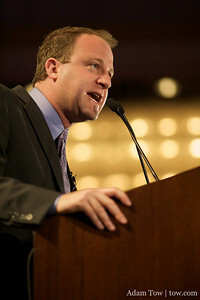 Next 5D Mark II with Jim Rose, Political Photography Part II: Jared Polis, and What Would You Invent?